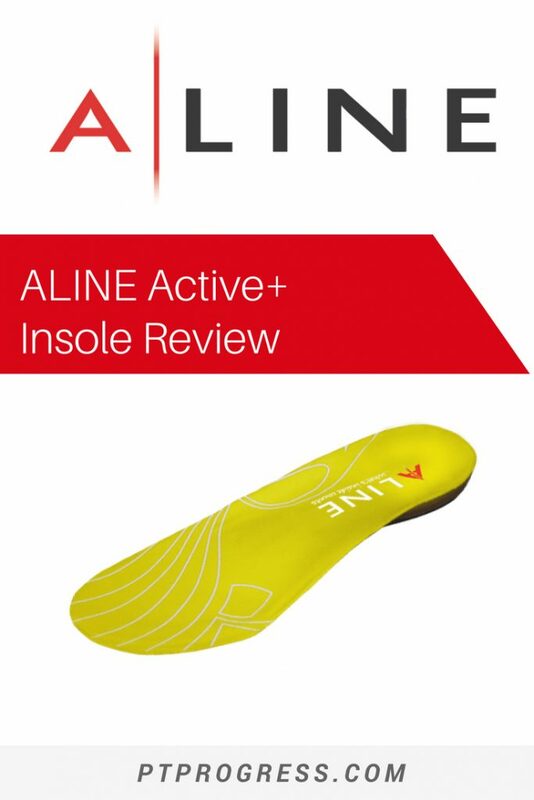 This ALINE insoles review was written by a Physical Therapist who actually uses the insole. I was provided with a set of insoles by ALINE, but was not compensated to write this review. You might have heard of the ALINE insoles as they’re one of the most talked about insoles for golfers and athletes. But they’re not just for elite athletes. By no means am I a high level athlete. But I am I Physical Therapist, and I understand the importance of having proper foot support and alignment, especially if you’re someone who has foot, knee, hip or back pain. The average person walks over 2 million steps a year – for someone with pain, those steps can feel excruciating. Each step sends forces through your joints that can cause pain and damage joint structures if your alignment is poor. You might have tried every insole available in the store. I get it – I’ve tried them too. In the clinic, I’m on my feet for 10 hours a day, so I’ve tried 4-5 insoles over the past few years. Without a doubt, the ALINE insoles have been the most supportive insoles I’ve owned. Most interestingly, they are the only insoles I’ve used that start with a focus on proper alignment. Some of the big name insoles provide cushioned support that feels good for a week, but wear down quickly. The ALINE insoles provide support by addressing the alignment of your ankle. There’s a reason Physical Therapists analyze your arch support when you have ankle, knee, hip, or back pain. The alignment of your ankle will affect the knee, hip, and back, which is why it’s so important to start here. Now I personally have gone through 4 or 5 different insoles over the last few years because I’m constantly on my feet. The same is true for my wife was is also in the medical profession. So when I got these insoles from ALINE, I was skeptical at first and didn’t know what to expect. But I’m happy I tried them because I think they’re one of the most supportive insoles I’ve ever used. The structure along the mid foot makes good contact along the arch of the foot. This aides in supporting the intrinsic muscles of the foot to give your arch the support it needs to avoid collapse or further strain of the plantar fascia. For those with higher arches like myself, it meets your foot where it is and gives a nice counter support along the back end of the arch. It’s not super soft, and that’s a good thing. You can expect about 1/8 of an inch of padding along the base of the insole. It’s not meant to be a soft pillow. Your foot probably doesn’t need a pillow; it needs support and structure. Layers and layers of gel padding make for a soft insole, but it doesn’t address the alignment problem most people have. If you’re not currently getting the support through your intrinsic foot muscles, ligaments and bones, then your foot needs a little help, and one of the best short term strategies based on research is to use an insole like this one. On push off, the insole “gives” at the right place and doesn’t feel restrictive. 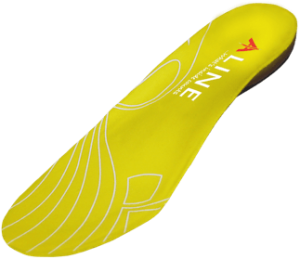 Whereas some insoles are stiff throughout, the ALINE insole has a supportive composite lining that runs the entire length of the insole, and becomes thin and flexible at the metatarsal heads. So There is flexibility but also the right amount of padding at the end of the insole where the toes extend which makes it more comfortable to wear in my opinion. I really like how the ALINE insole has a deep heel cup to support the calcaneus or heel bone. This can be a very painful spot for people with plantar fasciitis or heel pain, especially if they have a bone spur. The combination of the supportive arch and well-shaped heel cup is the key to providing relief for people with heel pain or plantar fasciitis. Since wearing the ALINE insole, I feel that the heel and arch support it gives has been great compared to all the other insoles I’ve tried. Of course I’m gradually introducing them to my walking routine and I recommend that same strategy for those who purchase a new insole like this one. I’ve clocked about 30 miles in these over the last 2 weeks so far and really like how they feel. Start With Good Alignment, End With Less Pain. One of the things I like most about ALINE insoles is their approach and philosophy in addressing foot pain, knee pain, hip pain, and even back pain. You see, one of the principles I stress in my practice as a Physical Therapist is to start with good movement patterns. So identifying poor movement patterns that lead to poor alignment can make the biggest difference in your recovery and performance whether you’re an athlete or simply need to be on your feet throughout the day. If you can’t tell I’m a fan of the ALINE insoles and recommend that you give them a try. At the $100 price point, they’re not a cheap insole, but your foot doesn’t need another cheap insole. If you take away just one thing from this review, let it be this: your alignment matters. It’s true that most people can make corrections to their movement patterns and alignment by starting a strengthening routine and with direction from a PT. But the research shows that one of the best strategies for decreasing pain immediately is to use an insole that focuses on support and alignment. That’s the basis of the ALINE insole and was the core reason they developed this insole in 2005. 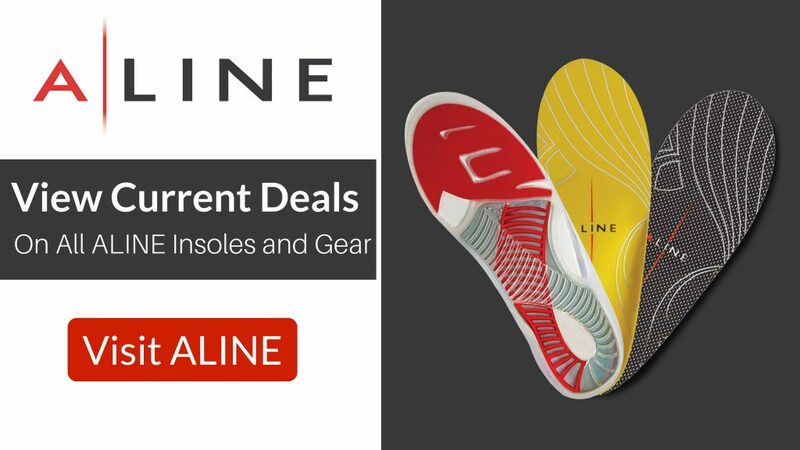 Take a look at the insoles they offer and the latest deals available on the ALINE products. Check out the latest deals and ALINE Insole coupons at ALINE. As an affiliate for ALINE, I may receive a small commission if you purchase the insole through my affiliate link. Of course, I only recommend products I use and find valuable.